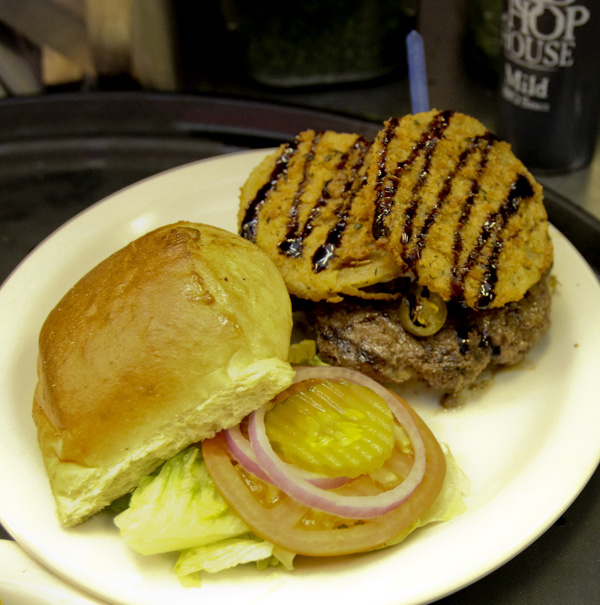 Published: Wed, October 16, 2013 @ 12:00 a.m.
Fried green tomato burger at Montana’s Rib & Chop House in Hermitage. Menu: 12 burgers ($7.99 - $11.99) Ask for the burger menu! If you’ve ever been to Montana, or “Big Sky” country, you’ve taken a relaxing ride, looked up and saw sky for as far as you could see. If you looked hard enough you might have even seen a burger in the clouds. Montana’s Rib & Chop House originators Burke and Melissa Moran opened their first Chop House in 2001 in Livingston, Montana. Their success has spawned six more Chop Houses, which are each locally owned and operated. There are two in this area. The Hermitage Chop House is owned by Tom Ristvey, who with his brother-in-law, also own a Montana’s in Meadville, Pa. Normally we don’t review restaurant chains, but this is far from a normal chain. If Tom thought bringing a Montana’s restaurant to the Midwest was a good idea, we had to see why. Montana’s Rib & Chop House brings big flavor and a laid back atmosphere to this area. It looks like a place where you would come dressed to the nines, but casual is the way to go here. And the atmosphere really does carry over to the food. The burgers are twice marinated, with a very good seasoning. The flavor is great, and the beef just melts in your mouth. Our waitress, Rachael McKinney, really added to our Montana experience with her fun attitude and jovial back-and-forth banter -- and she knew where the burger menu was. We looked over the regular menu and found a Hamburger, Cheeseburger, and a Double Cheeseburger. Hearing there were more, we asked Rachael, and she pulled out the “Burger Menu” from her pocket, complete with eight very tempting burgers, and a Build-Your-Own option. Now we were happy! The menu had a great half-pound assortment: Piggy Burger (with BBQ pulled pork and Bacon), Fried Green Tomato Burger (two fried green tomatoes with bleu cheese and a balsamic reduction), Mushroom & Swiss, Texas Burger (Swiss, BBQ sauce, beer battered onion rings), Chophouse Burger (a special rib seasoning and a special BBQ sauce), Yankee Burger (coleslaw, shoestring fries), Avocado & Swiss Burger, Hot n Crunchy Burger (hot and crunchy provolone cheese), and a Build it yourself Burger with cheese (You can add any three of these toppings: bacon, grilled onions, jalapenos, mushrooms, coleslaw, baked beans (yes), fried green tomatoes, avocado, pulled pork, shoestring fries, and lump crab). The burgers are accompanied by lettuce, tomato, onion and pickles nestled nicely on a fresh roll, which was toasted perfectly. You have your choice of fries, baked beans, soup or salad for your side. Some of us wanted to start off light and healthy, so we ordered salads, but we had a lone wolf who went with fries. When his fries came out we all grabbed one to see if we missed out on anything. The fries were thick and crispy with a light seasoning on them. Either item was a good choice. We looked over the menu, and the burgers all sounded great. We went back and forth on what we wanted. When the burgers came out, we did our taste test and were more than pleased with our selections. JT chose the Piggy Burger and remarked, “What can I say? I love burgers. I love pulled pork sandwiches. This was 2 in one! The pulled pork was in a savory, tangy barbecue sauce that's flavor didn't overpower the deliciously seasoned ground round. Add crispy bacon? As Mr. Food would have said, Ooh, it’s so good!" "And a shout-out to our waitress, who's impeccable service and good humor set the stage for a very enjoyable evening. Thanks, Rachael!" We would like to thank Tom for bringing the laid-back feel of Montana -- especially the burgers -- to our little neck of the woods. Take a “Big sky” ride to Hermitage, Pa. and try one of these burgers, but MAKE SURE to ask for the special burger menu. Your taste buds will thank you -- in a Big way. Keep reading the Valley food section each Wednesday for the best food the Valley has to offer, and send your burger suggestions to mvbrb@hotmail.com. Like the Facebook page BurgerGuyz to keep up with all the latest burger news.